Do you remember when the word “groovy” was popular? Probably not. You would have to be of a certain age. 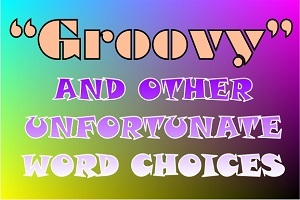 Around 1967, though, “groovy” was THE slang word to use. Today’s modern equivalent would be “awesome”; around 1950, “peachy keen.” It’s not merely that the usage is stale; in their time, these words were so overused that they became hollowed out or bleached of all meaning. “Awesome” used to mean “capable of evoking awe.” Nowadays, it merely signifies that the writer or speaker is vaguely supportive of something, like those awesome hot dogs on a stick from the food court at the mall. You look like a sheep. Instead of projecting the idea that you’re an independent thinker or a leader, you become just a member of the flock. You’re heading off with your fellow sheep with no real insight into the destination. In just a few years, you are definitely going to feel sheepish. The word-of-the-day has a short shelf life; in fact, once it becomes raging popular some people will already be calling it trite usage. “Groovy” peaked in popularity, and by the mid-1970s it was considered stale. Popular songs and written works that had appropriated the word were now considered faintly embarrassing. To the extent that when “groovy” is remembered at all these days, it is as the faintly ironic name for a programming language. You want your online writing to have future value. The very best articles and blog postings are what we term evergreen content because they will have imperishable worth to your potential clients. But if you salt your writing with words that will soon be considered out of fashion, you sacrifice the enduring quality that is your goal. Okay, now we’re getting to the fun stuff: the list of overused phrases that once were vital metaphors and now only weigh down your content. Sometimes, a great author can take unpromising material and make it sing. For instance, look at how Shakespeare makes a mixed metaphor sound absolutely perfect in Hamlet: “…to take arms against a sea of troubles, and by opposing end them.” One does not battle a sea with weapons, even the “slings and arrows of outrageous fortune,” yet Shakespeare’s genius is sufficient to make it all hang together. Action item. The world of business management gives us this term, which would reduce everything to an agenda checklist for a corporate meeting. Business buzzwords are best avoided. Arguably. Too noncommittal. It’s used to say, “I want to suggest that this is true, but I’m afraid someone with more status will disagree with me, so I won’t come right out and commit to my claim. Instead, I’m going to suggest that some people somewhere may believe this claim.” Have the courage to stand by your convictions. At the end of the day. This phrase isn’t meant literally, but more on the order of “when all factors have been considered.” It’s quite impossible to consider all factors. This is a relatively new phrase that is already a cliché. And it’s wordy, too. Bottom-line. Another appropriation from business jargon, this phrase reduces everything to the profit or loss on a balance sheet. Like the text message TL/DR (“Too long, didn’t read”), it’s a deliberate rejection of nuance and complexity. Unfortunately, the world is a nuanced and complex place. Curated. The current fancy-pants way of saying that someone assembled a collection of things thoughtfully. Ducks in a row. To have one’s ducks in a row means to be thoroughly prepared, allegedly based on the real-world instinct of ducklings to follow Mama Duck in a single file. This phrase emerged as a business cliché in the late 1980s. It quickly became overused in popular culture and now is a stale remnant. Empower. To give power to; generally used by people who lack authority and clout within the organization to further their own plans, much less share power with others. Game-changer. Overused since the 1980s. Not only is this a tired phrase, it smacks of self-aggrandizement. Those who use it tend to be boasting that their new idea will transform some realm of human endeavor. Usually, it doesn’t. Going forward, moving forward. British comic David Mitchell objects to this management jargon (note: some adult language) more eloquently than I can. Iconic. An icon is an item of religious artwork, often a painting. Then the word was appropriated for clickable computer graphics. And today, “iconic” is taken to mean “representative of a large class of similar things.” The modern meaning is at least potentially insensitive to religious feelings. Worse, the failure to be specific about the class of things referenced robs “iconic” of any practical meaning. If I say “the Empire State Building is iconic,” then what is the set of things that the building exemplifies: Manhattan landmarks? American architecture? Buildings with lots of windows? Tall things? It is what it is. A tautology masking as a deep insight. “It is what it is” actually is a very pessimistic—almost fatalistic—stance. It promotes doing nothing, because all action is futile: things will always be what they are. Learned helplessness is never very attractive. Drop this from your writing vocabulary. Proactive. A made-up word based on the false notion that being reactive to events is a bad thing. Everyone tried to anticipate future requirements, so “proactive” adds no meaning to any sentence that contains it. Touch base. Here we have a sports metaphor that has become tired from overuse. Send this one to the showers. Fresh ideas will nourish the readers who visit your law firm, medical practice, or small business website. But you do not have to express those ideas in highfalutin language or today’s trendy jargon. Favor simple words that express your ideas clearly and succinctly. Yes, you can play a little with language if you believe that will amuse your audience (and if wordplay suits the tone of your article), but showing off shouldn’t be the main focus of your presentation. Honest communication is the essential part. Need help? Foster Web Marketing is ready to give you a hand with content writing at every level, from supplying tips on usage and grammar to providing customized pieces to post on your website. Give us a call or use the quick contact form on this page. And while you’re at it, consider sharing your own point of view in the comments to this post. What stale buzzword or trendy cliché do you find most annoying—and what do you do to make sure that phrase never shows up in your writing? We’re all waiting to hear from you!